Where do all the Wrens go? I only ever notice one at a time in my garden… that’s when I do spot them. Early morning or just before dark (I’ve found) is a good time to keep a lookout for this tiny, secretive little bird that has a pretty big mouth for its size… all the better to belt out that powerful voice with my dear! Meanwhile back in our gardens... secretly, just like Jack climbing his Beanstalk, the Wren makes its way up and down through shrubs and bushes in a land where we are the Giants! Oh… and that Old Woman Who Lived in a Shoe… you know that one who had so many children she didn’t know what to do? Well, she doesn’t have the packed house that the Wrens do come Winter! The BTO say the record number of Wrens seen roosting together in one box is a staggering 63! At just under half the weight of the (also small) European Robin, the tiny Wren chills much more rapidly than larger birds. Together they keep warm but in freezing weather many don’t survive. This is not my video of Wrens arriving to roost together. It is fascinating to see this behaviour. Note this video is over 7 mins long. You might want to scroll through it a little. The Snow Queen isn’t kind to the Wren then? 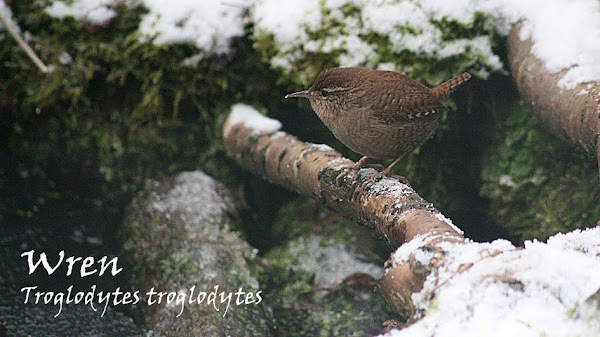 Oh no she isn’t… as when she covers the ground in her icy white carpet she also hides much of the food that the Wren eats like small insects and spiders. Like all other birds in winter, the Wren needs to eat lots to get enough energy to survive cold nights. Ah… but Jack and his Ivy covered Beanstalk come to the Wren’s rescue in winter. Yes, deep in skyward bound Ivy growing in our gardens… treasure sits in wait for the Wren. Oh dear… Incy Wincey Spider doesn’t think this story has a happy ending! Regular visitors to my blog will know by now that I like a good bit of storytelling! Tonight’s tales begin a series of introductions to the birds that visit my garden. I’m also hoping it will help those taking part with the RSPB Big Garden BIRDWATCH at the end of the month with ID’s. Another secretive garden bird, The Dunnock, was to be my first introduction but late yesterday afternoon I spotted a Wren feeding around my (now snow free) small rock pool pond. It fed there for some time. I was able to get my video camera running as it ran and jumped back and forth. Most unusually for this secretive little bird, it spent some considerable time out in the open. It can be seen characteristically bobbing up and down. It turns around and you can see it from the back too. It was hard editing back footage of this visit. The key things my video of the wren will show is that (despite the first clip) this bird is hard to see. One minute you see it and the next it is behind or under something. It also moves about at a speed almost like it has no attention span at all. When the light is low it just blends into the background. Shape wise the Wren is quite a round bird, with no neck, tiny wings and a short tail that sticks up into the air. It also has a pale stripe over the eye and light brown legs. Being mainly an insect eater, the Wren has a long thin bill which is slightly curved and tapered... perfect for the job of pulling out hidden insects from the smallest of spaces. This video was filmed through my window, background music has been added. A few years ago, I saw the Wren in flight during the middle of the day. It was fascinating to watch as it went through the canes of my bamboo with its distinctive whirring flight not unlike a big bumble bee. It certainly caught my eye that day. At the moment, I have an array of books around me open on pages with info on the Wren. I have enjoyed reading more about this tiny bird that I see only occasionally. I could add more stats etc but I myself am more interested in observing the character of birds that visit my garden. That’s what I hope I have succeeded in sharing with you tonight. I sat enthralled with the first video Shirley. It facinating to watch them snuggle in for the night. I am amazed that any of them can sleep with all the wiggling and jockeying for position. Here in the states we call this wren a Winter Wren. I only occasionally get to see it here and only during winter. There are two other wrens that come here. The House Wren (Troglodtes aedon) is here only during summer to nest. The Carolina Wren (Troglodtes ludovicianus) is here year round. As a matter of fact it was singing here this morning when it warmed up and was raining. I am sure it thought it was spring. It will have a terrible jerk back into reality when it gets cold and snows again, which is predicted for us Thursday. Enjoyed this post and watching the wren video. I had a old wasp nest under my eaves here and Carolina Wrens used it to roost. One could usually find 5 little wren heads sticking out with a flash light at night. Brilliant Post....you certainly have a way with words. Wrens are lkovely - they are always in and out of the ivy on my wall - and i am constantly surprised by hoe loud they are - how can such a small bird make such a big noise ? You were really lucky that the wren stayed in one place for as long as it did Shirl. It almost seems to be p[laying a game of hide and seek with you. Funnily enough we have lots of dunnocks in our garden - most times when we look out we see at least one. Yesterday we had three at once - they love the fat cake in the upturned coconut shell. They perch lodged in one of our trees. there's a lot to be said for revisiting the commonplace. We often overlook wrens, dunnocks, sparrows, starlings and the like as they are everywhere and so often just overlooked. Last year I warched a wren in a willow which was flapping its wings at an amazing speed as it sang. Truly inspiring and something which could so easily be overlooked. Very nice post! and I enjoyed the video very much as well. Enjoyed reading about your wren. It took ages for me to identify the little brown bird that never stopped for a minute, with it's tail stuck in the air..flit flit flit...but that was four years ago. We only had the one (I think), but we saw three this past summer. A good hard worker in the garden for sure. Lisa, I was delighted to find that video link. This is the only Wren we have and it sounds pretty much like your winter one. I don’t see it that often and will treasure the video I captured of it out in the open. I love to hear about all your different Wrens. Hope your songstar enjoyed a brief warm up and you didn’t get it too cold with you. Brenda, great, enjoyed hearing your story too. Quite a little character isn’t it? A very imaginative post Shirl and most enjoyable! Wrens are usually so difficult to spot in the garden I think, not only because of their rather skulking behaviour but also because they are so well camouflaged. Excellent post Shirl. I haven't seen or heard too many Wrens yet this year so it will be interesting to see what effect the difficult winter conditions have had on this delightful species. The wrens in the box reminded me of the Marx Brothers' stateroom scene in A Night at the Opera! Your wren at the pond was so adorable! Thanks!